“Football saved my life.” Belize’s top football player, striker Deon McCaulay can thank football for much more now. He grew up in a less than ideal neighborhood, but through perseverance, has made a big breakthrough after being drafted to play with the Silverbacks of Atlanta, USA. Despite facing a dilemma when the Belmopan Bandits initially refused to give him his local football club release, the Belizean superstar has settled in and begun the pre-season with his new club. Deon McCaulay is the first Belizean to play professional football with a North American team, and has thus written yet another piece of Belizean football history. 26-year-old McCaulay, father of one, spoke to The San Pedro Sun’s Jorge Aldana about his dreams, his early childhood in a society that often throws curveballs at its youth, and how he succeeded in life as a player and as a Belizean man. 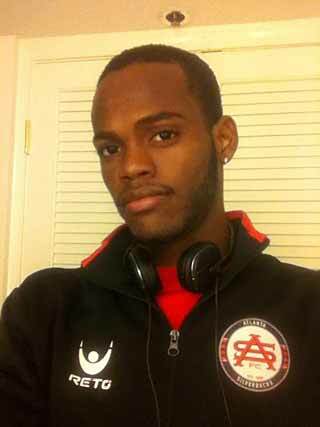 Deon McCaulay (pictured) has gotten his Atlanta Silverbacks career off to a good start. The Belize international has two goals in his first four games. Each day he steps onto a soccer pitch, Deon McCaulay does so with motivation derived from several sources. The 26-year-old striker plays to make a better life for his family, to represent the people of Belize and to open doors for other Belizean soccer players. He is now a member of the Atlanta Silverbacks, signing with the North American Soccer League club in February. McCaulay previously played professionally in Belize for Kremandala, FC Belize, Belize Defence Force and Belmopan Bandits, in Costa Rica for Puntarenas and for Deportes Savio in Honduras. He had a trial with the Portland Timbers of Major League Soccer, but his current home is in a city with a population larger than all of Belize. McCaulay earned worldwide notoriety by scoring a competition-best 11 goals in qualifying for Brazil 2014, matching the totals of Robin Van Persie and Luis Suarez. Belize didn’t progress to the FIFA World Cup, but the team did play in the CONCACAF Gold Cup for the first time last summer. The Jaguars finished bottom in a group that contained the United States, Costa Rica and Cuba. A taste of competing in the prestigious tournament, however, has made McCaulay and his teammates hungry for more, especially with Copa Centroamericana – Central America’s qualifying competition for the Gold Cup -- coming up later in the year. McCaulay knows there is pressure on him every time he steps on the field, but he embraces it and stays grounded.